FoodBlogga Etiquette Tip #43: At dinner, never discuss politics, religion, or the issue of fruit on salad. I was at dinner with friends recently where they served a delightful mesclun salad with fresh strawberries and parmesan cheese. Well, I thought it was delightful; my dinner companions disagreed. As we were discussing benign topics such as the recent "humidity" we have been experiencing here in San Diego (laughable compared to the rest of the country this summer), I pointed out to one of my friends that she hadn't eaten any of her strawberries. "Don't you like strawberries?" I asked her. "Oh yes, I love strawberries," she replied, "but not on salad." I was truly surprised by their passionate responses. Do you like fruit on your salad? And if you don’t, then help me understand why. Here are two fruity salads that I just adore. (Anti-fruit&salad people might want to avert their eyes). My Watermelon and Green Olive Salad is adapted from a June 2006 recipe in Food and Wine. It's sweet and salty and savory all at once, plus it’s a pleasing blend of smooth and crunchy textures. I added the cooked shallots for their rich, caramelized flavor and seasoned it with lots of fresh parsley. Heat 1 tsp olive oil in a small skillet over medium-low heat; add shallots and cooked until slightly caramelized about 5-7 minutes. Whisk 1 Tbsp olive oil, vinegar, and watermelon juice until blended. Season with salt and pepper. Add mesclun to plates, top with watermelon chunks, olive slices, and fresh parsley. Drizzle with dressing and enjoy! I posted this Arugula, Strawberry, and Sugar Snap Pea Salad on Fit Fare back in June and had to post it here because it’s just too scrumptious not to share. I love the interplay between the sweet strawberries and peppery arugula which are complemented with a zippy, lemon-balsamic dressing. The fresh basil and mint really make this salad shine, so make sure you don’t skimp! For dressing, whisk all of the ingredients in a small bowl. The sugar snap peas can be eaten raw or cooked. To cook, simply drop in boiling water for 2 minutes; drain and plunge into a bowl of ice water. This will stop the cooking process and preserve the peas’ bright green color. To prepare the salad, divide the arugula, strawberries, and sugar snap peas evenly among four plates. Add dressing; top with fresh basil and mint. Since these salads are loaded with health-promoting antioxidants (especially lycopene in watermelon and strawberries), I'm submitting this post to Cate of Sweetnicks for her ARF 5-a-day Tuesday. Here are a few more fruity salads I came across recently. If these bloggers like fruit in their salad, then I know I’m in good company. I absolutely LOVE fruit on salad! In fact, at salad bars, I often mix regular salad with fruit salad. To me the flavors of fruit with acidic dressings are different, but wonderful. My mom dislikes fruit on salad. To her, food should be savory while desserts should be sweet. She hates any hint of sweet in entrees, as do some other people in my extended family. A lot of Iranians love sour and acidic flavors, but not sweet, at least when it comes to main courses. Anyway! Your salads look incredibly refreshing. Having professed my love of fruit on salad, I have to confess: I've never had watermelon in that way. I might just have to experiment! I absolutely love fruit on salads, Susan - I think they're a fantastic add in. Nuts and cheese are on my top list, too. I bet a many of the people who say they don't like fruit on salad have never even tasted it - they just leave the fruit on the side of the plate without even trying it. I used to dislike fruit on salads, but have come 'round to the classic strawberry-sort in the last few years. I still don't like overly-large pieces of fruit, but little hints of sweetness are perfect! MMm, and I'm a HUGE fan of watermelon salads! Hmm. I love apple pieces in salad, as well as strawberries in spinach salad. I think some people are just averse to anything new. I once had dinner with a man in a Japanese restaurant who refused to pick up his bowl of miso soup to drink it. He had to have a spoon. He cut his sushi with a fork and knife. People get their food preferences baked pretty early on. Sad isn't it? People are really quite passionate about their food. I don't know how I feel about fruit on a salad, but I'd probably eat it regardless. I hate to waste food. I do like fruit, especially strawberries and peaches, on salad. But it has to be the right salad and the right dressing, you can't just throw them on a salad and douse them with 1000 Island, or Ranch or something like that. Fruit on salad is one of those things that I think I don't particularly care for and never crave yet every time I actually try it I find I enjoy it. When I hear "olives and watermelon" my first reaction is, NOOOO! But I'll bet it's delicious and I bet I'd enjoy it. The interplay between different elements (sweet and salty, sweet and savory)is often the thing that makes for really memorable food. And it's good to challenge your food assumptions! I don't understand what's not to like about fruit on salad. 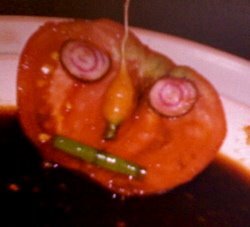 I think some people just have an ingrained image in their head of what a salad is, and sweet, juicy, deliciousness can't be a part of that image. However, a salad is really just any group of things mixed together, right? I don't know - I love the combo of spicy green, sweet fruit, and tangy vinegar. You can make me a fruity salad any day of the week! I LOVE fruit on salads. I almost always put some apple cubes in. I like the sweet and crunchy contrast to the rest of the salad. I recently tried strawberries on salad and I was blown away! I bet I'll love watermelon on salads too. I adore fruit on salad -- can't imagine why I didn't discover it earlier. My favorite combination these days is nectarines and blue cheese on a green salad, with some garden tomatoes, maybe steamed asparagus too. I've always liked some: apples, melon, strawberries, oranges. I'm starting to like more: watermelon, grapefruit, peaches. this is strange because i'll pretty much eat anything but cilantro - tastes like pennies to me, strawberries in salad - just dont like it, and raisins, in anything. In recent times I too have changed my thinking a little. I think that as long as the fruit that's chosen is pefrectly ripe and some consideration to flavour has been made, all is well. For me it was a salad with blueberries (perfectly ripe and organic), fennel crisp and sliced wafer thin and juicy orange segments. It was extraordinary. Well, now you can't stop me. Your strawberry salad looks divine Susan. Bazu-That's interesting, since so much of your likes and dislikes result from what were fed as children. I do hope you try watermelon; it's sensational! Patricia-I think you might be right about that. Skat-I know what you mean, too much sweetness can offset the balance of flavors. 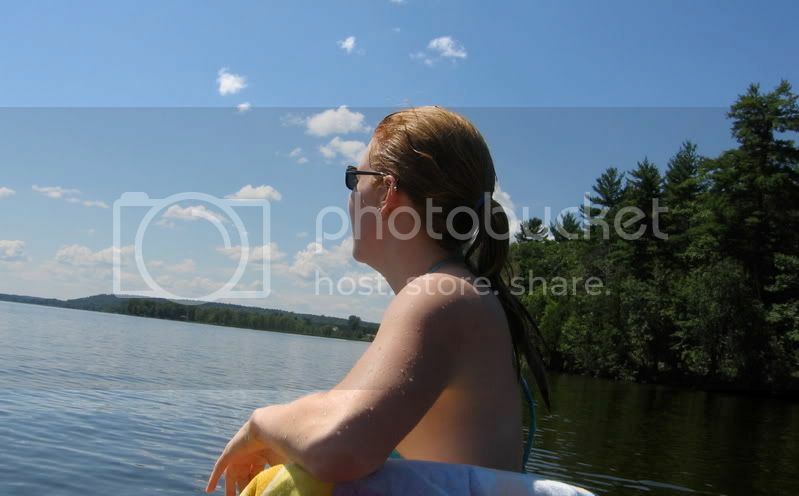 Elise-It is sad if it precludes people from trying something new that could lead to something wonderful. Kelly-Well, try some and let me know! Sara-Good point. I find light, citrusy vinaigrettes work well. Julie-I felt the same way when I first heard it, but after one taste, I was addicted. The flavors are explosive together! Foodette-You're my kind of salad lover! Cinderelly-I like dried fruit too, especially on grain salads. Lydia-Nectarines and blue cheese are a match made in heaven. Katiez-Grapes I like, but I agree about the mandarin oranges. I find the syrup too sweet and the oranges too mushy. You got really great responses! I never thought about, don't remember when I first had fruit in a salad several years ago but I've sure never looked back. Fruit in salad is a given now. I love fruit on salad. I think people that don't have a mental block in their minds. They need to realize that it's not weird. Think about cranberry sauce on turkey. Or how tomatoes are actually fruits! I like fruit in salads. I think the people that don't are probably just not used to it, so there's that fear of the unknown and sticking to what you know. Like some people think eggs on burgers are weird and others don't. Your strawberry salad looks really good! And has all my favourite ingredients. I like strawberries and raspberries on salad a lot. To be honest, I have never had watermelon on salad before. I've been timid about trying it, but you've convinced me with that beautiful photo and delicious recipe. Thanks! I think it's a perception issue. And that is odd, since all of the contrasting flavors you describe sound wonderful together. I know watermelon is appearing in everything now, but for some reason I have a hard time imagining, not as a stand alone, but as an ingredient. Waldorf Salad with apples is a winner, and I'm a big fan of pear salad with blue cheese and walnuts. Maybe I'm accustomed to the more savory fruit salads. The sweeter fruits seem out of place to me in a salad, but I'm willing to give it a try! I could eat fruit on anything. In anything. With anything. I do like fruits on salads. I think there are already too many "rules" about food. I guess everyone has their own preferences. My favorite salad has strawberries on it. I make it all the time, but eat everything but the strawberries. Isn't that strange? I love the strawberry flavor in the salad, but I don't love the berries themselves with all of the dressing and things on them. These salads look lovely! While I am not a fan of sweet meal foods, like pineapple on pizza, or raisins in a rice dish, I do like fruit on salad. Strawberries are great, but so is watermelon, pears, oranges too. KarenR-That's so true about the turkey and cranberry, yet they're so perfect together. Eatmedelicious-Would you believe, I've never seen a hamburger with an egg on it? I"ve seen an egg on a ciabatta sandwich with ham or sausage but not a hamburger. Thanks for the comment! Em-Oh, I'm so happy to hear that! Thanks! TW-We were skeptical at first too, but now it's one of our favorites. Kate-Glad to hear you're open to so many possibilities! Kristen-How funny. Your family must like them then. Judy-I'm not keen on pineapple on pizza either, but I do love raisins with cooked grains. Susan, you should open a shop where only your beautifully made salads are sold, I'm sure you'll be well-known for them!!! Gosh, I love it! I love fruit on salads. I was getting a little tired of the standard Fuji apples and feta (or goat cheese). I recently served a blood orange salad with a balsamic vinegrette (with shallots) that was wonderful. Ruling out a whole class of foods in a type of dish is just wrong. I love strawberries with balsamic, blue cheese or parmasan, candied nuts, etc. Classic. That might give an outlet to your non-friends who like fruit on salad. I LOVE fruit on salad: grapes and romaine with balsamic vinegar and olive oil; strawberries and spinach; peaches and mesclun; YUM. It's a flavor/texture thing that I think is glorious and made for each other! I am all for fruit in salads! And both your salads here I would eat up in a flash! :) In fact, the presence of fruit makes me more excited about a salad! Susan, thanks for the link to my salad with peaches. Guess that pretty much says which camp I'm in. I think the naysayers at the recent dinner party need to get a hobby. 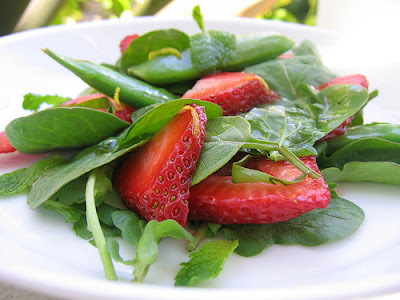 Your arugula, strawberry and sugar snap pea salad sounds especially wonderful! Is your friend out of her mind?! Has she even tried it. Fruit on salad is fantastic - strawberries ,melon, figs! It goes so well with a great balsamic. I will definitely be enbroiled in a discussion with her too! Wendy-Oh, yes, blood oranges really elevate a salad. Abby-Oh, yes, I love peaches on salad too. Terry B-It was my pleasure! Gournet-You're welcome. Glad you like it! I love fruit in salads, particularly in the summer time! Just let your guests have a taste and you can put this argument to bed for good! Your salads looks always sooo delicious. I actually got finally dates and pecans... and I'm going to redo your salad again, this time with proper nuts and dates not raisins. Sometimes a blanket dislike of that order (which has nothing, really, to do with the actual taste, or the particular foods) is an indicator that the person likes, eating-wise, to color inside the lines. Breakfast food should be eaten at breakfast, dinner food at dinner, salad food needs to be vegetal, etc. I find it vexing to encounter that sort of blanket resistance (it'd be one thing if they didn't like THAT pairing, because fruit in a salad can be great, or horribly ill-conceived), but... I am not without my own tics, so I can't throw too many stones.